Mike, Rocko, George Eggen (The Hotey owner), Rick, and Fritz tip some Jager at the FPB Fan Club Holiday Party "after party" at The Hotey on December 12th. A stage right photo taken during the closing tune, 'Silent Night' at the FPB Fan Club Holiday Party on December 12, 2009. Members of the Scherz, Vaccaro, and Nelson families joined FPB on stage, along with Rocko Dorsey and Mike Faraino. A stage left photo taken during the closing tune, 'Silent Night' at the FPB Fan Club Holiday Party on December 12th. Fritz and Rocko "back to back" with their dueling accordion and guitar during 'Pay Me My Money Down' toward the end of the FPB Fan Club Holiday Party on December 12, 2009. Gabe, Fritz, Betty Miller (FPB Fan Club Member), Rocko Dorsey, and Mike Faraino are shown here on December 12th during the FPB Fan Club Holiday Party. Tom, Fritz, Gabe, Mike, and Rocko are pictured here during FPB's rendition of 'Stormy Monday' at the FPB Fan Club Holiday Party on December 12, 2009 in Verona, NY. Tom and his Gibson during the FPB Fan Club Holiday Party in Verona, NY on December 12th. Frank and his Fender on December 12, 2009 at the FPB Fan Club Holiday Party. Mike Faraino, Gabe, and Rocko Dorsey are shown here during the FPB Fan Club Holiday Party on December 12th. Special guest, Brian Nelson (Frank's son) sings a tune with Fritz's Polka Band during the FPB Fan Club Holiday Party in Verona, NY on December 12, 2009. Special guests (center and right) Sam Markle and Tony Cutrie (Fritz's great nephew) are shown here with Fritz as FPB plays a tune on December 12th in Verona, NY. Fritz, Rick, and Gabe are shown here on December 12th at the FPB Fan Club Holiday Party in Verona, NY. 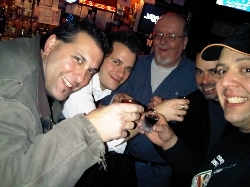 During the FPB Fan Club Holiday Party on December 12, 2009, the guys in FPB and members of the FPB Fan Club have a Jager toast to honor the memory of the late Fred Scherz Sr (founding FPB member who passed away November 14, 2009). Fritz, Rick and Gabe are pictured here on November 21st during FPB's gig in Marcy, NY at the Utica Maennerchor. Tom and Frank are shown here during FPB's gig on November 21, 2009 at the Utica Maennerchor.